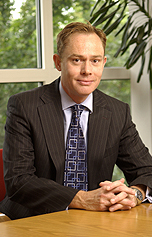 Simon is CEO and co-founder of EDW Technology. Since EDW’s inception, Simon has spearheaded the development of its leading Energy Retail solutions. Under Simon’s leadership, EDW has delivered advanced technology together with professional services and support to drive value and profitability for its customer base. Simon graduated from Durham University with a first class degree in Physics and then completed a Doctorate there in Semiconductor Physics sponsored by BT. He now has over 22 years' experience in the IT industry, specialising in the Energy and Utility and Financial Services sectors. Simon worked initially in the Technology Division for Accenture, where he advised blue-chip companies like British Gas, Xerox Finance and Cable and Wireless. He then joined the White Clarke Group as Manager of their software development division, where he was responsible for projects including a pan-European Contract Management System for Daimler-Chrysler Financial Services. Simon founded EDW Technology in 1995 and has been successfully steering its growth ever since.